Beautiful pet friendly 1,975 sq. ft. vacation rental located in The Bluffs in Bend, Oregon. 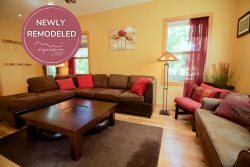 This newly remodeled vacation rental with air conditioning, vaulted ceilings and new wood floors throughout, offers accommodation to sleep 8 with four bedrooms and three full bathrooms. King master suite is located on the upper level of the vacation home, with large walk in closet, an on-suite bathroom with dual sinks, shower. Queen guest suite #1 is located upstairs with an on suite full bathroom. Queen guest suite #2 is located on the lower level of the vacation rental with third full bathroom located downstairs. Queen guest suite #3 is located on the lower level with an armoire, sliding "barn" doors for complete privacy and private sliding door entrance to a private small patio with a cafe table and seating for two. The fully equipped spacious kitchen has stainless steel appliances, four burner gas range with griddle and a breakfast bar for two and seated dining for 8. Relax after a long day on the mountain cuddle up on the leather sofas in front of the cozy gas fireplace in the living room with a large flat screen LCD with Apple TV. Fully fenced pet friendly backyard is equipped with a hot tub, lush landscape with patio table and chairs for four and a gas barbeque grill making this a perfect place for your family and friends to gather and make memories together. Don't Want to Drive to Mt. Bachelor Ski Resort? All vacation homes are in close proximity to the Mt. Bachelor Ski Resort Shuttle! Mt. Bachelor is partnering with Safeway (320 SW Century Drive) to provide a shuttle ticket sales location in Bend. Less than 1/2 mile from the Shuttle Park & Ride lot, you can purchase 1-ride, 2-ride or 10-ride punch cards at Safeway before you get on the bus. Please allow yourself enough time to purchase your tickets at Safeway and get to the Park-n-Ride lot in time to avoid missing the bus. Buses depart promptly at their designated times. You can catch the Mt Bachelor Shuttle at the Bend Park-N-Ride lot located on SW Columbia St between Galveston and Simpson. Or, at select times during the day, you can connect to/from the Mt. Bachelor Shuttle at CET's Hawthorne Station. Bend Oregon Vacation Rentals, The Bluffs NEW LISTING! We prefer electronic checks or checks and accept Visa, Mastercard or Discover cards. The 12.2% lodging tax of rent applies to all reservations as well as cleaning fees. An Accidental Damage Protection fee of $69 per reservation (non-refundable) for up to $1,500 accidental damage for accidents that are not consider malicious. Pet Friendly with prior approval and $20 pet rent per night paid.